In an attempt to finish up the big box of dates at home, I tried making Date cake from Shilpa's blog. You can find the original recipe here. I had tried this cake couple of weeks back. I felt it was too sweet for me even though it was so tasty that it was consumed within a day. So, thanks to Shilpa for the wonderful recipe. Here is what I did. I used about 24 dates, reduced the sugar to 1/2 cup, added a pinch of salt, added about 1/2 cup of shredded coconut, used 1/4 cup of applesauce and 1/4 cup oil, 1/2 tsp of cardamom powder and baked in a 8" pan. This was the variance that I added compared to the original recipe. The rest of the recipe I followed as it is and baked for about 35 minutes with home made bake even strips and the cake came flat and rose really well for an eggless cake. I was actually taking this cake for one of my friend's birthday, but when you are trying to make such healthy dessert, it doesn't make sense to ice with all butter and sugar and make it unhealthy. I just stuck couple of gum paste roses which I had made awhile back and piped cornelli lace and piped reverse shell border. Icing is cream cheese icing. Here is the picture. Lovely frosting and prefect cake.. Simple yet elegant frosting on the cake.Liked the addition of coconut in the cake. This looks fab for an eggless cake, you have inspired me to try it out! Priya, Jayasree, Bindiya, thanks for the comments. 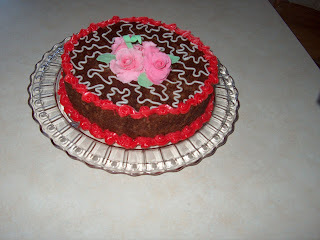 Bindiya, yes it rose really well and didn't drop in the center like most egg less cakes do. It makes it easy to decorate if it stays like that. all your cakes are really attractive to look at especially this so simple yet very presentable. the apple sauce you use is sweetned or unsweetened because that should vary the sugar content. secondly can I pressure cook the apples with the skin on peel them after cooked and grind to paste instaed of mashing it. should that consistency work fine for cakes? Applesauce I used was unsweetened. You might do that. As long as there is not too much water added, it should be fine. You can even add very thick yogurt instead of applesauce. Champa I baked a vegetarian fruit cake with dried fruits in it some teaspoons of rum something like christmas cake added some caramel in it.the cake appears to be ok just that it is little hard to touch.in Christmas cake after baking they feed the cake with brandy or rum.since I don't want the rum flavour to be very prominent can I feed it with orange juice?Can you please guide I need to take it for a social gathering tonight.I know it is not related to your recipe But I thought I can count on you since you have good knowledge about baking. Orange juice works, but will give the orange flavor. If I want to make a cake moist, I use simple syrup. Equal amounts of water and sugar heated up till all the sugar dissolves and comes to a rolling boil. Turn it off, cool to room temperature and spritz the cake surface with it. If you have a squeeze bottle, it works great. Otherwise use a small spoon and spoon it over little by little. It will keep the cake moist.